The Slaton Harvey House. Then, a West-taming way station. Now, a nostalgic B&B and West Texas historical landmark. 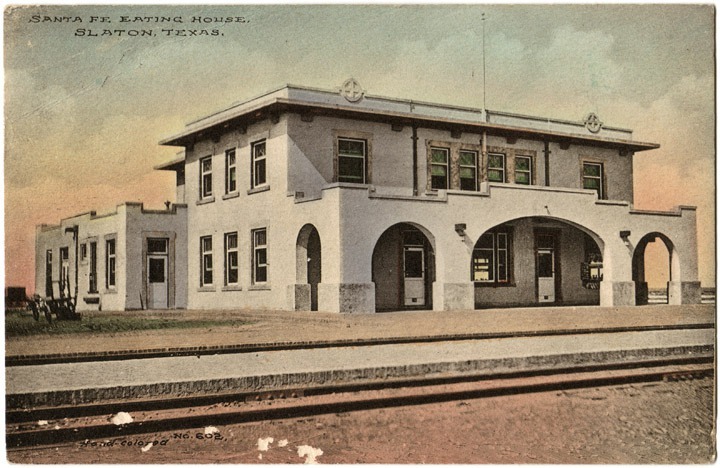 SLATON — Hungry passengers rushed off rail cars while kitchen staff hurried to prepare their perfect meals. Despite the rush, everything seemed perfect. From the spotless tablecloths to the newly polished silverware and the friendly waitresses, Fred Harvey knew how to run a restaurant. “He was very particular over everything. His dream was to have Harvey Houses from Chicago to San Francisco, and that dream came true,” said Jolene Fondy, whose parents worked at branches of the famed railroad stop. Slaton’s Harvey House operated as a restaurant from 1912 to about 1942. 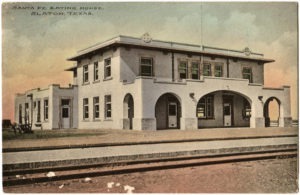 One of about a dozen such establishments in Texas and a larger number in the rest of the Southwest, its location along the Santa Fe Railroad brought customers from pretty much everywhere. Calvin Lamb can recall sounding a gong each morning to announce breakfast. The longtime area resident worked as a busboy and dishwasher during the Harvey House’s heyday in the early 1940s. Visits to the historical building bring back some great memories, and — due to the vast workload — some not-so-great ones. Now 89, Lamb still shudders a bit when he remembers being ordered to clean the restaurant’s windows every Friday. He’d put hours of effort into washing every inch of the panes. Just when he thought the job was complete, his manager, Mr. Bowman, would adjust his bifocals, examine the glass and tell him he missed a spot. The bossy chef, Mr. Wells, wasn’t much easier to work for. The waitresses — known as Harvey girls — could attest. But a perk of the job was certainly the food. What customers considered a quick off-road treat was for Harvey House staff a daily indulgence. When Lamb was new on the job, his co-workers fixed him some hotcakes. The hungry teenager dived straight into the meal. Working conditions also got easier when Lamb gained the respect of his manager’s wife. Mrs. Bowman seemed more lenient with the staff she considered her favorites, and Lamb was surprised but pleased to become one of those lucky workers. The administrator of the overall company had been dead 40 years at the time, but left a legacy of perfection to which he expected Harvey House branch managers to adhere. Fred Harvey was not known to accept anything less than the best. “Fred Harvey was real particular about his tables. It was always fine china and linen,” said Sue Davis, vice president of the Slaton Railroad Heritage Association. Davis, a retired schoolteacher, leads efforts to restore the building. She and other volunteers give tours by appointment and use it for events such as weddings and bingo games. Upstairs, four bedrooms can be rented as bed-and-breakfast suites. Another room downstairs is being renovated to fill the same purpose. With its location by the train tracks, Slaton seemed like a natural spot for a Harvey House. Before the company was created — Fred Harvey’s first off-railroad restaurants were introduced in 1875 in Wallace, Kansas, and Hugo, Colorado — passengers were more limited. “It was a real rudimentary way to travel. They might find a restaurant, or they might not,” said Tony Privett, a former president of the Slaton Railroad Heritage Association. That changed with Harvey Houses. Strategically located a few hours apart from each other throughout the Southwest, the restaurants could be considered the country’s first fast-food joints. Without sacrificing quality, focus was on speed and efficiency. Railroad staff took meal orders from passengers while the train was still moving, then communicated them via telegraph to Harvey House chefs. Their food was waiting when they arrived. To further speed the process, Harvey girls arranged passengers’ cups and saucers by their drink orders. Cups were placed right-side up for coffee drinkers and upside down for hot tea, while a titled cup signified iced tea and a cup placed away from the saucer meant milk. But while customers had only about 20 minutes to eat before they returned to the road, staff stayed longer. Most, in fact, actually lived there. The Harvey girls — many of whom had moved from out of state to take the job — had rooms upstairs. Lamb had his own living space away from them. Since then, some parts of the building have changed more than others. The industrial sink where he washed so many plates, for instance, has been replaced with a smaller, home-kitchen-style one. The red tile floor, though, looks just as it did three-quarters of a century ago. “We scrubbed that floor with soapy water every morning,” Lamb said with a sigh.